Creating online ads has grown in complexity with the importance of mobile advertising, and with the increasingly large amount of money moving into the online advertising market. The costs for individual ads has increased as ad space and ad placement has grown in importance. What does all of this mean for small to medium to large businesses? Headaches! Not only are companies having to spend more and more for the coveted placements within search engine results pages, but they are also having to pay more for the best placements in content networks. Due to the rising costs for ads and the competition for the best placement, most advertising systems have complex tools to allow Advertisers to build ads with a goal of displaying them for specific keyword phrases. The problem with this approach is that sometimes there are keywords in or around the sought after keyword phrase that should keep an ad from being shown. 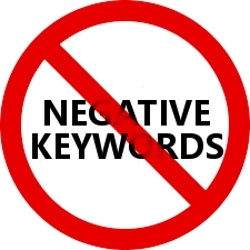 The term for these types of keywords is ‘negative keywords’. Basically, instead of creating ads and targeting them to specific search terms and search phrases, Advertisers have to come up with a list of ‘negative keywords’ to prevent their ads from being shown when they shouldn’t. Think about all of this. First, Advertisers need to be creative in creating their ads. Then Advertisers need to determine which search terms and search phrases should cause their ads to be shown. Lastly, Advertisers have to try to come up with all the ‘negative search terms’ that should prevent their ads from being shown. It takes experienced SEO advertisers to be able to navigate the ever complex obstacle course that has become commonplace in the creation and display of online ads. Many companies are finding that they have to dedicate an individual (or many individuals) solely to managing online ad creation and display. While many other companies just give up and outsource their online advertising to third parties claiming to be able to manage online advertising campaigns effectively. The Niche Ad Network self-serve ad system is straight forward and extremely easy to use. The foundation of the system is based on highly targeted Niche Ad Channels matching niche website Publishers with appropriate niche ads. Advertisers do not have to worry about any negative keywords. Advertisers simply create their ads and place them in the appropriate Niche Ad Channels, and their ads will be displayed ONLY on websites approved to run those Niche Ad Channels. Instead of having to try and imagine all the odd negative keyword combinations that should prevent their ads from being displayed, Advertisers can focus their attention solely on ad creation and on choosing the appropriate Niche Ad Channels. Basically, Niche Ad Network makes it easier for Advertisers to create and manage their advertising campaigns without having to guess all the negative keywords that could affect their ads and their ad budgets.